NEW !!! modern and cozy flat at 15 min from Paris center, for 8 persons! Very nice apartment completely renovated, decorated and furnished by an interior designer, with a modern and elegant touch. The apartment has 3 bedrooms each with it's own dressing room. The fully equipped kitchen is equipped with a dining table for 8 people and a relaxation area. The bathroom, it has a large shower, and an independent toilet. This charming apartment has been beautifully decorated in a contemporary style. You will have a good feeling of space and you will find everything you need during your stay. Also the place is really quiet, easy accessible and safe. Very nice renovated apartment in old building, decorated and furnished by an interior designer with a modern and elegant touch. The apartment has 3 bedrooms each with dressing. The kitchen is open to the dining area features a dining table for eight people and a relaxation room, reading. The bathroom, renovated, it has a nice big shower, a washbasin with mirror and separate toilet. This charming apartment was well laid out in a contemporary style, you will have a nice sense of space and you'll find everything you'll need during your stay: modern amenities, a very good bedding whether the reads like a sofa bed, a bathroom new and spotless water, all quiet, bright. Hello, We can offer you a private chauffeur service. This service is not mandatory. It is very easy to use. The driver picks you up from the airport, behind the luggage with a sign with your name. He will transport you to the apartment. This is a taxi or taking public transportation. Rates are: Airport CDG - Paris 65 € Up to 3 pers. Airport CDG - Paris 75 € From 4 to 7 pers. Airport Orly - Paris 55 € Up to 3 pers. Airport Orly - Paris 65 € for 4 to 7 pers. Roundtrip to all Parisian train stations 45 € Up to 3 people Roundtrip to all Parisian train stations 65 € From 4 to 7 people See you soon! We had a wonderful stay. The location is great, close to metro lines, across from a great grocery store & plenty of good local restaurants to choose from. Really appreciated Vincent coordinating a shuttle for us and Kevin meeting us at the appartment to explain everything. Can't recommend it enough. Great location! Wonderful to be on the ground floor and very safe! We used the limo service going and coming which was big plus! The neighborhood had everything! Two grocery stores a few steps away. Two blocks to the Metro. Great to have a washing machine and dish washer. Very secure and safe. It was small but great for 3 singles who each wanted their own room. We were a group of 7. (5 adults and 2 kids (11 & 10)). The apartment/flat was small for our group, but it had everything we needed. It's location was great and convenient. Grocery stores, restaurants, bakery, and metro were all near by. There was no A/C in flat, but fans were provided. It was very warm in the flat at night even with windows open. Overall, the stay was nice. Great location, nice, clean accommodations, great for 8 people! Good location, 5 min walk to line 1 metro. Great pastries across the street and good supermarket. Quiet and comfortable. Thanks for everything, our stay was very pleasant !! We will recommend you to our friends !! This apartment is professionally managed by a local letting agency rather than the owner. The service was very friendly with great comms by text message. Process is smooth provided you let them know an ETA for arrival - don't expect an owner to be there waiting for you. We also used the lower cost parking in a nearby basement offered by the managing agent. 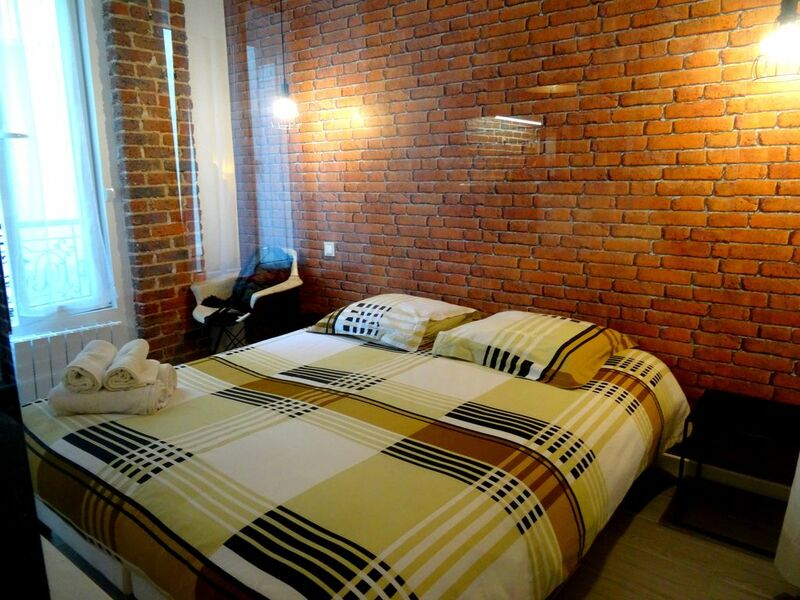 Apartment is located in an authentic residential neighbourhood for a real Parisian feel, not a tourist spot. Great range of shops, cafes and restaurants right outside the front door. Several Metro and RER A stations within easy reach. Kitchen has dishwasher, washing machine, hob and microwave but no oven. Two of the three bedrooms are tight for space as all have double beds. Its located on the ground floor but secured by motorized shutters over the door and both windows. Courtyard outside is shared space with bins plus the back windows of the kitchen of the restaurant fronting onto the street but this is no issue. Great find and really enjoyed our stay.